There are a variety of reasons why some of us end up with thread veins on our face including, a heredity predisposition (if your parents suffered it’s likely you will too! ), sun damage, aging, steroid use and also pregnancy. 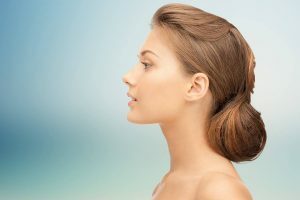 They are most common on the cheeks and sides of nose. These veins aka telangiectasia are small dilated blood vessels and the good news is that they usually respond very well to IPL treatment in often as little as one or two treatments. Rosacea is a very common inflammatory condition of the skin, it often presents as a red facial flush along with telangiectasia. The cause of rosacea is not known but there are a number of environmental factors that may aggravate the condition. While rosacrea responds well to IPL treatment it cannot be cured and maintenance treatments of often required to control the condition. Sider Naevi are little red “spots” with feeding capillary legs, if you press on the spot it will blanch, these lesions respond well to IPL treatments. How does IPL work for these lesions? Our machine emits light which is absorbed by the pigment (haemoglobin) found in these vessels, this causes a thermo-coagulation of the vessels and following treatment the body just absorbs the damaged vessels leaving little or no trace of the initial lesion. It is important to note that 100% clearance cannot be guaranteed, there are a number of issues which will impact on the result, lifestyle factors as well as size, depth and density of the vessel in question. A complimentary consultation and patch test are required prior to any treatments to ensure suitability. Most people develop pigmented lesions of some type over the course of a lifetime. IPL can be used to treat specific types of lesions including, freckles (ephelides) and age/liver spots (Lentigines). We do not treat melasma/ cholasma which is a discolouration caused by pregnancy, the contraceptive pill or other hormonal medication. Moles also cannot be treated. Similar to the vascular treatment, our Excelight machine emits a light which is absorbed by the pigment (melanin) in the lesion, this light is converted to heat which destroys the excess melanocytes. Following treatment, the lesion will darken and form a thin micro-crust, it will peel off over the space of a week or so, leaving the area treated without excess pigmentation. Again, 100% clearance cannot be guaranteed and sun exposure may result in the appearance of lesions. Multiple treatments may be required and maintenance are often necessary.